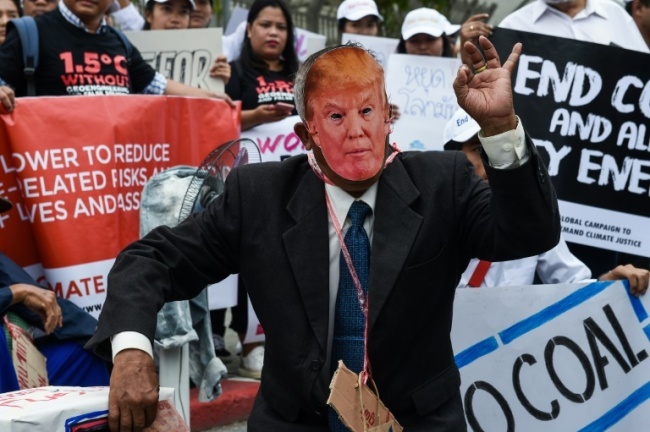 Thai fishermen and labourers whose livelihoods are threatened by rising sea levels kicked off an international day of protests in Bangkok Saturday, where key UN talks are attempting to breathe life into the Paris Agreement on climate change. As global warming races ahead of efforts to contain it, the discussions are deadlocked over a number of contentious issues, with activists demanding immediate action to prevent irreparable damage to the planet. The "Rise for Climate" protest movement -- which has organised events in dozens of countries on Saturday -- wants governments to end their reliance on fossil fuels and transition fully into renewable energy. 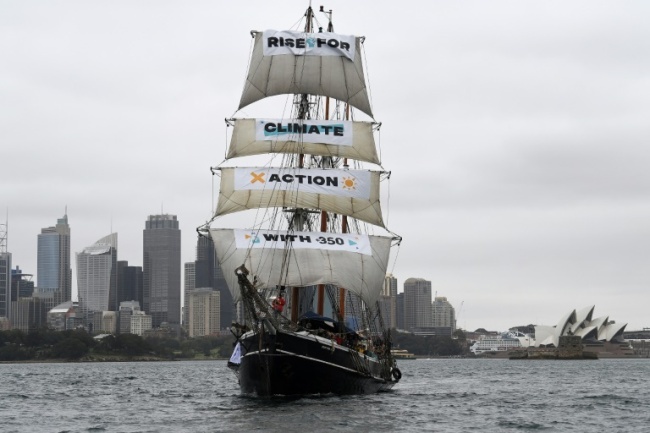 Beginning in Australia, a tall ship moved through Sydney Harbour in front of the Opera House as activists on board held up protest signs. Its billowing sails featured banners that read "Rise for Climate; Action with 350" -- referring to environment advocacy group 350 which spearheaded the global protest. Blair Palese, CEO of 350 Australia, said that the country -- heavily reliant on coal mining for its economy -- has long suffered the effects of climate change. "We are fighting bushfires in winter, suffering a crippling drought, and scientists fear back-to-back bleaching of the Great Barrier Reef this summer," he said. In the Thai capital, some 200 protesters assembled in front of the UN regional headquarters, where delegates were discussing how to implement measures agreed by world powers under the 2015 Paris Accord on climate change. The talks aim to create a draft legal framework for limiting global temperature rises that can be presented to ministers and heads of state at a final round of discussions in Poland in December. The delegates have been meeting since Tuesday, but have made little progress, according to multiple sources close to the negotiations. 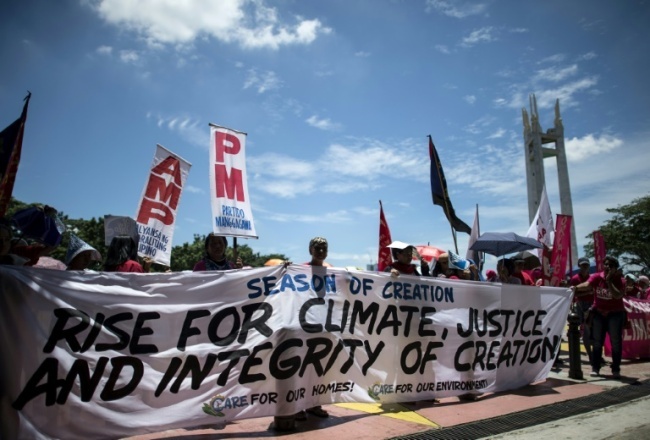 "The negotiators are not taking any action," Ruchi Tripathi, head of climate justice at charity ActionAid, told AFP. Dozens of labourers and fishermen from the Gulf of Thailand, whose livelihoods are threatened by rising sea levels and coastal erosion caused by climate change, joined Saturday's protest. Many brought examples of their produce, including crabs and shrimp, and held banners demanding that delegates take action. "I came here today to ask the government to put coastal erosion on the national agenda," 58-year-old fisherwoman Aree Kongklad told AFP. She said that the mangrove forests near her coastal home had been destroyed, jeopardising the supply of crabs which are her livelihood. 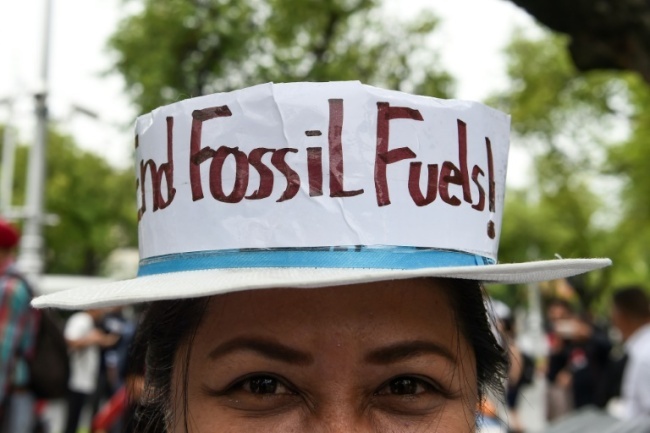 In Manila, more than 800 people, including one dressed as a T-Rex holding a "Go Fossil Free" sign, marched through the streets protesting the country's heavy reliance on coal. Along with Bangkok, the Philippine capital is projected to be among the world's hardest hit urban areas by climate change impacts. "We are among the most vulnerable and we are among those still stuck in an energy system that is backwards," campaigner Chuck Baclavon told AFP, adding that the government is out of excuses. "We came out in support of this global initiative because it draws attention to a very urgent and important issue," said Red Tape Movement founder Prabhat Misra.